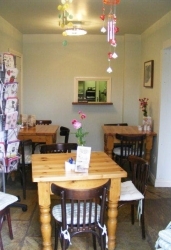 Come and visit our Tea Room and enjoy our refreshments and country home cooked foods! On warm summer days, we serve both food and drinks outside where children can enjoy the play area and small animal park. In-between having a browse around and just simply doing your weekly shop, you can take some time out to relax with a hot or cold drink and light refreshments in our tearoom or outdoor seating area whilst browsing the seasonal plants on sale. On those bright and sunny days the kids can burn off some energy in the outdoor play area with seating suitable for families to watch over their children, before having a look at the animals in the small enclosures. You can even get a chance to see the robotic milking machines down at the farm. If you would like to speak to a member of staff about our team room facilities and products, contact us today by calling on 01772 786198.